The Work of God in this Philadelphia era was introduced into southern Africa in 1954 when the World Tomorrow program began to be broadcast over Radio Lourenço Marques in the then Portuguese colony of Mozambique. This broadcast continued until 1972, while the mailing list of The Plain Truth increased and readers corresponded with the office in Great Britain. Evangelist Gerald Waterhouse conducted the first Church service in Johannesburg, South Africa, on March 18, 1963, with 33 people attending. A few weeks later 42 took the Passover, and the following year Mr. Waterhouse established the Johannesburg Office. Through those early years members in southern Africa became firmly grounded in the doctrines of God's Church and the prophecies of God's Kingdom. By 1967 Plain Truth subscribers numbered 9,000, with more than 800 readers taking the Bible Correspondence Course. Most new subscribers learned about The Plain Truth through advertisements in the family magazine Personality. In 1969, Robert Fahey was transferred from Australia to handle the responsibilities of the southern Africa office and Church. Beginning in 1971 the World Tomorrow television program was broadcast free on the government television station in Rhodesia (now Zimbabwe). Four years later the World Tomorrow radio program began to be broadcast weekly, free, by the government- owned Rhodesian Broadcasting Corporation. By 1975 the Plain Truth mailing list was up to 70,000 subscribers. Some of this growth was because of responses from a newsstand program at outlets throughout South Africa. In July, 1978, after Mr. Fahey was transferred to Pasadena, Roy McCarthy was sent from the Dutch Office to serve as regional director in southern Africa. Seventeen churches (1,349 members) and 31 Bible studies are now in southern Africa. The Plain Truth mailing list stands at 85,500, with 40,000 additional copies appearing on newsstands each month. Twenty- two employees, of which 15 are ordained ministers, serve in God's Work here; three local church elders assist. The World Tomorrow continues to be broadcast on the medium-wave and shortwave bands from Radio Swaziland. Pastor General Herbert W. Armstrong's three trips to southern Africa have been highlights of God's Work here in recent years. Mr. Armstrong was first here from May 26 to June 22, 1976, and spoke to both the late South African President Nico Diederichs and South African Prime Minister John Vorster. He also met Chief Kaizer Mantanzima of the Transkei and a number of South African cabinet ministers and members of Parliament. The pastor general received wide press coverage during his travels. He gave five Plain Truth lectures, five lectures to prominent service clubs and a number of press, radio and television interviews, The second visit, in November, 1976, was cut short when Mr. Armstrong sprained his ankle after addressing a meeting of Plain Truth readers in Port Elizabeth four days after arriving. Robert Fahey continued the planned engagements, which included meetings with government officials in Lesotho, the president and prime minister of Rhodesia (now Zimbabwe) and lectures to service clubs. Mr. Armstrong made his third visit during March, 1977, addressing the South West African Constitutional Conference and the Transkeian Parliament. He also conferred with King Sobhuza II of Swaziland and a number of South African leaders in government and industry. Roy McCarthy returned with his wife to South Africa in 1978 to become regional director for God's Work in southern Africa. He succeeded Robert Fahey, now Mr. Armstrong's executive assistant. Both Dr. McCarthy and his wife, the former Tine Visser, graduated from the University of Cape Town. While Dr. McCarthy was studying medicine , his wife to be was studying for a degree in languages. The McCarthys' first contact with God's Work was through listening to the World Tomorrow program on Radio Lourenço Marques. Two years of studying and checking into the Bible led Dr. McCarthy to give up his medical practice in 1966 and request baptism. Then, in September, 1967, the McCarthys and their four children moved to Bricket Wood, England, to attend Ambassador College. (All four of the McCarthys' children later graduated from Ambassador.) Dr. McCarthy served in the office of student body president during the last of his three years at Ambassador. After graduation he directed the Dutch arm of God's Work and supervised the Mail Processing Department in Britain. For four years Dr. McCarthy commuted from his home in England to the Netherlands every week to conduct Church services. In 1974, he and his wife moved to Holland to oversee the translation and distribution of De Echte Waarheid (the Dutch Plain Truth), as well as handle all advertising and correspondence. He also pastored two churches. Dr. and Mrs. McCarthy are happy to be back in their home country and enjoy serving in this area of God's Work. God's Work in southern Africa is enjoying substantial increases. During 1981 mail income was up nearly 40 percent in both South Africa and Zimbabwe. Some 187,000 letters were received, and literature sent out from the Johannesburg office totaled 315,000 pieces. In two years the Plain Truth mailing list has grown 64 percent to 85,000. This is largely due to a 1980 advertising campaign and to a steady flow of responses to the newsstand program. Some 26,000 new Plain Truth readers have been added to the list through 40 advertisements, 21 in newspapers and 19 in family and news magazines. Together these publications had a circulation of about four million. The Good News is sent to more than 3,800 people, and more than 18,000 (21 percent of subscribers) have started the Bible Correspondence Course. One earlier advertisement, which quoted extensively from Pastor General Herbert W. Armstrong's 1979 address to a group of ambassadors in Tokyo, Japan, brought exciting results. Placed in the Sunday Times (circulation 480,000) in August, 1979, it drew 975 responses. Four hundred ninety-seven (51 percent) renewed their subscriptions after receiving a renewal letter, and after one year one was a member, 16 were co-workers, 36 were donors and 258 were studying the Bible Correspondence Course. 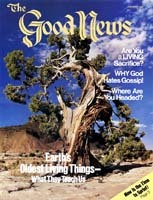 Newsstand outlets throughout southern Africa distributed 420,000 magazines in 1981; 19,000 people were added to the Plain Truth mailing list from this method of promotion. In 1980, for the first time for this part of the world, more than one million Plain Truths were printed and distributed in all. In 1981 the number increased to 1,285,000. The Johannesburg, South Africa, Office oversees the Church in Zimbabwe and handles the printing of The Plain Truth (i 7,500 copies) for that country. One fulltime minister, Ron Stoddart, and a local church elder, George Efthyvoulos, serve the 211 brethren in Zimbabwe's two churches and two outlying Bible studies. Most of the members live in or near the two main towns, Salisbury and Bulawayo. After several years of civil strife and bush war, the country is settling down to a more orderly way of life, although the friction between tribal groups is far from removed. The Johannesburg Office also administers God's Work in the island nation of Mauritius and in Zambia. Thirty three members live in Mauritius, and 24 live in Zambia. Plain Truth circulation in Mauritius is 1,900 and in Zambia is 1,100. During 1980 and 1981 ministers from South Africa traveled to Mauritius to conduct the Feast of Tabernacles. In 1981, 63 people attended, with Sydney Hull from the Bloemfontein church officiating. The 1981 Feast of Tabernacles was also observed on the Zambian-Zimbabwean border near Victoria Falls. For the first time all brethren from these two countries could meet together; attendance was 378.